The Denver Art Museum has an exhibition titled Her Paris which showcases female French Impressionists. The most rewarding aspect of the exhibition was in the discernible insight that the women bring to the Fine Arts compared to their male Impressionist counterparts. When proclaiming that the women had strong interest in depicting intimate social settings, it is not to obviate the likes of Renoir (though to be clear his main patrons were women). It is to say that, even when capturing social settings impressionistically, they do so with a novel approach which is outside of the bounds of the male perspective. This exhibition, then, is a celebration of artistic expression. It is the proof of concept of the strengths of a liberal society, one which enables and even celebrates a diversity of culture. For the more individualities that are expressed, the more possibly expansive the culture’s reach. So then, let us start with the feminine interest. No man of 19th century Paris, clearly, has keenness for painting a still life of pink slippers. Nor do they have such an adoration for the changing fashions of the 19th century, and the opulence the contemporary women were beginning to drape themselves with. Here, the female artists made the centerpiece of the artwork the decorated female form, rather than in a male perspective which often times treats the subjects in the composition as elemental objects of a bigger picture. And yet, the women were not fearful of the grand. Lunch in the Greenhouse by Louise Abbéma is a gargantuan 6’x12’ and painted in an academic Neoclassical style, particularly with the horizon point. It is clear that this painting is the definitive muscular flexing of her artistry, due to its grandiosity and fastidious character study. Ms. Abbéma is interested in the social dynamics of the work, not so much a study of the setting itself. This is most delightfully exhibited with the little girl’s back turned toward the viewer, as opposed to a more artificial construction from a portraiture which a man may render (see The Oath of the Horatii below). Contrast this female focus with the male thirst for the grand in their contrasting Neoclassical pieces. Also, it is interesting to note the matriarchal role in the portrait, with a regal flowing, perhaps satin, dress which is delectable to the female eye. 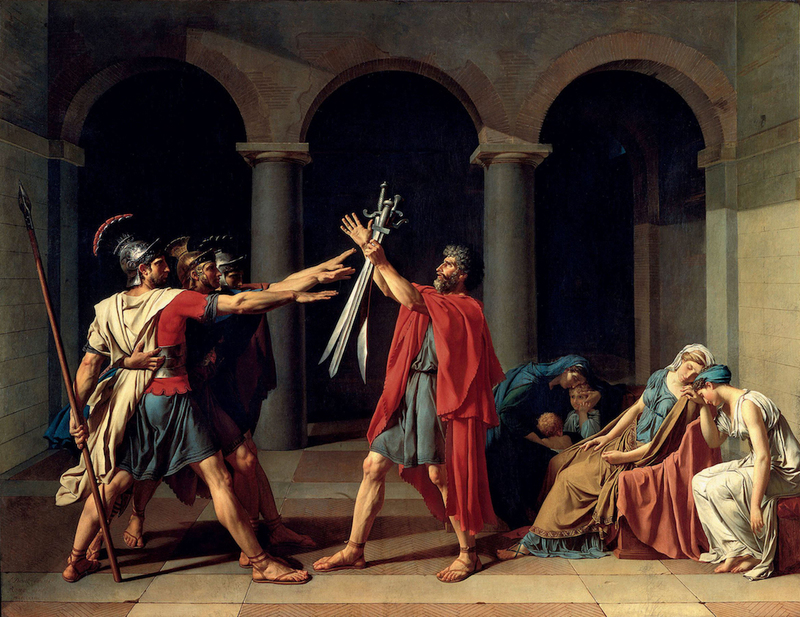 ‘Oath of the Horatii’ by Jacques-Louis David. Returning, however, to the theory that social intimacy is the reign of women is categorically evidenced by the capture of maternity in its noblest form. How neglected in today’s society is the appreciation of a womanly bond to her child; frequently now children are tended more by paid services than by a genuine mother. And this bond is angelically portrayed in two compositions, especially one with an infant son. The chiaroscuro mastered by Caravaggio for sacred and religious purposes is inventively used for other sacredness, with a female twist. It is a genuine strike at genius how the light centripetally draws into the infant’s helpless, vulnerable, baby face. And this vulnerability is nourished fully in the arms of a mother, celebrating the very act of love. A price cannot be put on this bond between a mother and her highest creative act, which is birthing human life. This, then, is a splendid celebration of femininity and antithetical to the radical feminist project that sees the nurturing of the next generation of humanity as an inferior act for a woman. 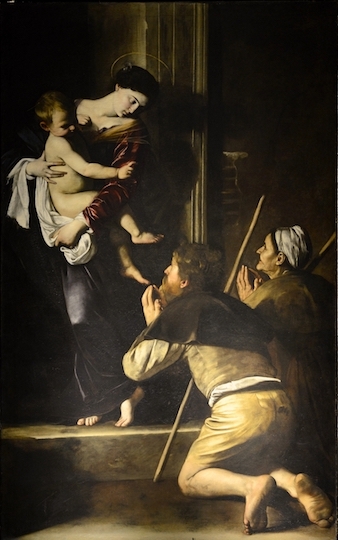 Interesting to consider further, Caravaggio’s powerful technique with his own Madonna and how it is testimony to the assertions of the limitations of the male mind in being able to capture beauty completely. For we see with his rendition an aforementioned degradation of maternal love in favor of a dynamic, dramatic setting. Last to comment upon the insightfulness of female artistry is the appearance of Biblical heroism in a pacific manner. David, no doubt, was the inspired subject of Elizabeth Jane Gardner Bouguereau because of his treatment by Master Fine Artists for centuries in Europe before. The chance to try her hand at the same subject must have been tantalizing. But instead of cloning the efforts from the men, which depict David triumphantly violent towards humanity, she distills his feat in a nobler and transcendent manner. 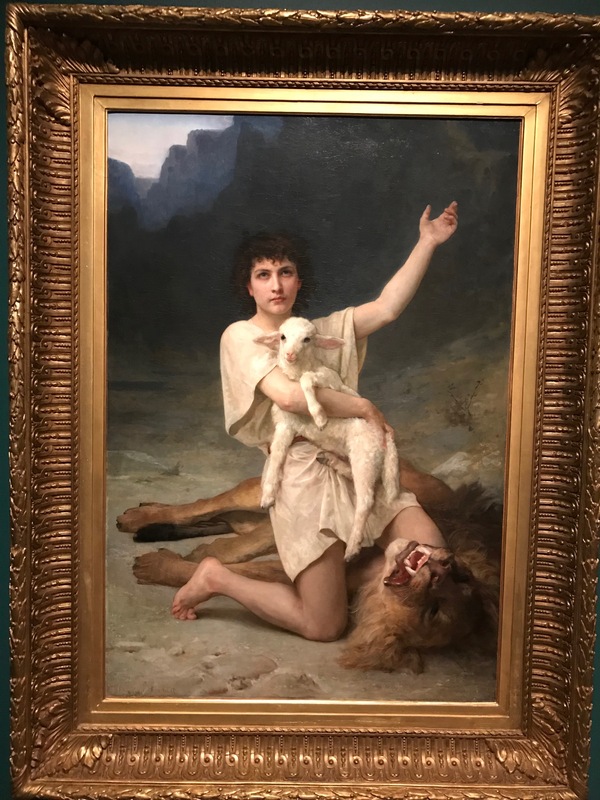 By elaborating on the colorful history of David as the shepherd with his target practice of lions while guarding his herd, Ms. Gardner Bouguereau emphasizes the nature of David’s triumphs as righteous. By eliminating the social from his act, we see more crystallized David’s glorious will. He acts according to what is right, not towards subjugating or submitting his fellow man and considering, by fiat, himself as righteous. Immediately we draw a connection with his quarrel with Goliath and see his showmanship was not vainglorious, as firstly his rehearsal of righteousness appeared while no one else had eyes on his victory over lions; but also, his slaying of the giant pertained to acting courageously for righteousness. It was not a chauvinistic rite in defending the God of Israel from slander; the very defense of his people’s God is a rightful one – as is the morale of the story. Like good art, the righteous manner is one which bears sweeter nectarines and crunchier walnuts for posterity to taste. This masterpiece is a celebration then of the courage to act righteously, one of the most formidable virtues to possess. Indeed, it is the quintessence of heroism; and a proper human aspiration.